Known as the “Belle Boyd Cottage” because of its association with the famous Confederate spy, this is one of the oldest buildings in Front Royal. Situated in a tree-shaded courtyard behind the Fishback Hotel, out of hearing of the noise and bawdiness of the street, it was reserved for the proprietor’s family and for the most exclusive guests. Many political, social and military leaders have stayed in the cottage, including President Franklin Pierce, who delivered a campaign speech to a large crowd assembled in the Town square. 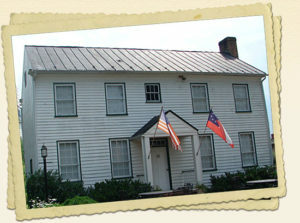 General Fitzhugh Lee, who visited Front Royal as a successful candidate for Governor, was served a midnight meal at the old hotel and spent the night at the cottage. At one point during the Civil War, Belle Boyd was staying with her relatives, the Stewarts, who ran the old hotel. During the war, Union officers used the hotel as headquarters whenever they held the Town of Front Royal. 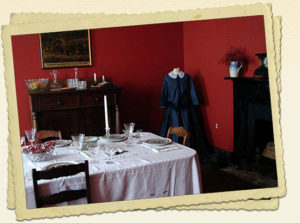 When Federal officers were quartered there, the family moved to the little five-room cottage and it was from there that Belle did her most well known service in connection with the battle of Front Royal which took place on May 23, 1862. Partially based on her information, “Stonewall” Jackson is reported to have advanced toward Front Royal, but at his first engagements with Union pickets he hesitated. 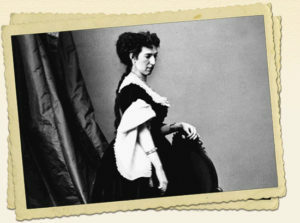 Belle Boyd heard the gunfire and knew that Jackson had to be informed that the Federals were leaving the town and he could secure the bridges over the Shenandoah River in Front Royal before the Union burned them in retreat. When she could find no man in the town willing to run the picket lines, she determined to go herself. Dressed in blue calico, with a white apron and bonnet, she presented a conspicuous target as she dashed over fields and fences fully exposed to rifle fire. The information was presented to Jackson and the strategic bridges were saved. Belle Boyd was imprisoned three times, “reported” some thirty times, arrested six times, and could easily have been “legally convicted and shot at sunrise” on the basis of evidence against her. It was not common practice to shoot young ladies however, and Belle not only survived the war, but went on to marry three times and have an active stage career. She had five children, four of whom survived. The cottage where she once lived was donated in 1981 to the Warren Heritage Society and moved to the grounds in 1982. The first archive building was attached to it as a repository of the lifetime research of Laura Virginia Hale.